The new trend in lighting our marine tanks, both FOWLR and reef systems, seems to be progressively leading to LED Lighting. Until recently, LEDs were too expensive to use for most lighting applications because they are built around advanced light emitting semiconductor material. These devices have dropped considerably in price over the last few years making LED lighting a more cost effective option for a wide range of applications. 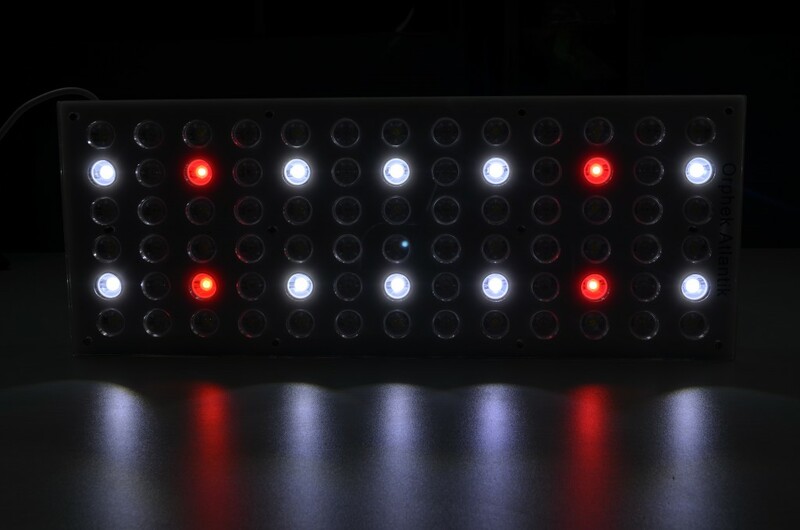 Although LED lighting systems are currently a little more expensive than T5, HQI, and MH systems, in the long run they are a better buy for the following reasons. What is a LED? 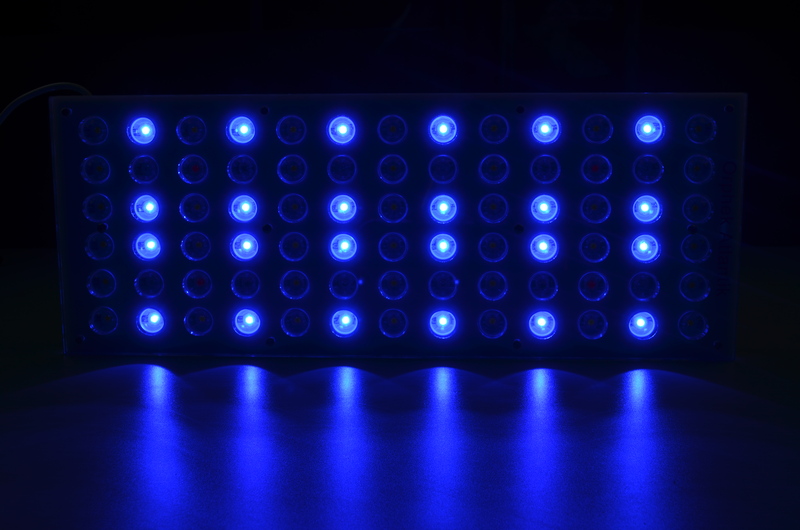 LED is an acronym for Light Emitting Diode. In simple terms, they work by applying a low voltage to a light emitting diode/semiconductor contained within the device itself. LED hoods can be affordable and fill basic fish only roles such as Marineland’s 16 one watt (with 8 lunar LED’s) 36-48” fixture, or a top gun system such as the Orphek Programmable LED Pendant which is available in two models (wide beam and narrow beam) and will support all coral and clam life. Another company, Reef Brite also produces comparable LED modules designed for retrofitting and/or installation in custom canopies although many other companies including Orphek allow some of their products to be mounted or hung in a canopy. Depending on the manufacturer, lamp life can vary tremendously, anywhere from 10,000 to 50,000 hours. Less expensive fixtures will generally use LEDs which provide somewhere between 10,000 to 17,000 hours of lamp life and can have up to 75 lumens per watt and PAR ratings not meant for reef aquariums. 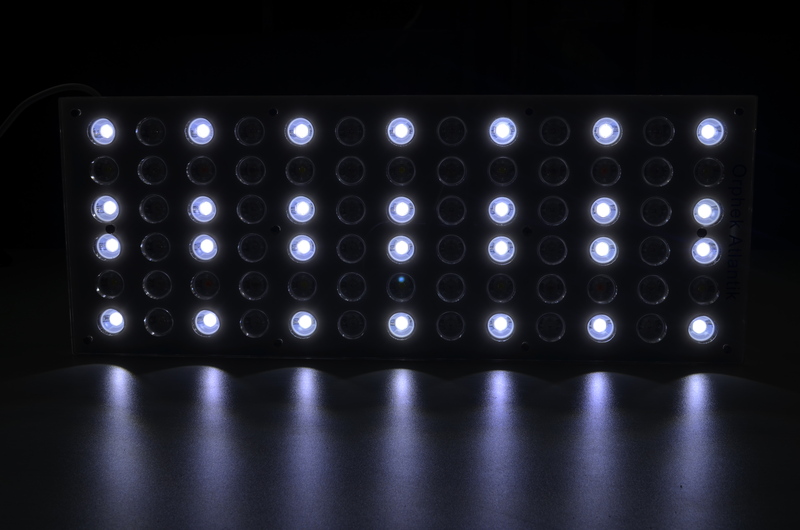 Higher priced fixtures such as those from Orphek use either more LED’s or higher output LEDs. Orphek LEDs have a much higher lumen per watt, PAR rating, and longer lamp life, up to 50,000 hours. How do LED systems stack up against other types of lighting? A test was conducted on a 20 inch cube tank lit by a fixture containing six T5HO lamps totaling 120 watts. At mid level, the PAR reading measured 170. Replacing the T5HO fixture with an Orphek Atlantik produced a PAR reading of 440. In all fairness, there are other factors to consider when comparing LED lighting to other types of lighting. Type of lamp, Kelvin temperature, and depth of tank will all play a role in comparing PAR readings. Aquarists with deep reef systems will obviously choose HQI or MH lighting as LED, T5HO, and PC light penetration are limited in this regard. The new Orphek Atlantik with a narrow lens is capable of providing sufficient PAR to grow SPS corals in tanks as deep as six feet. “It’s quite obvious that the LEDs have come of age in providing a viable solution to lighting reef aquaria. While a lot of other factors that may be involved in making decisions such as power savings, cost, longevity, controllability, cost of ownership etc. these are not the factors considered here. Based solely on quantitative light output data, I am excited about the future of this technology for reef aquarium use.” Sanjay Joshi, Advanced Aquarist Magazine, February, 2010. Energy savings are one of the biggest assets of using LED lighting. If we take a twin 175 watt metal halide fixture and use a rate of .15 per kilowatt hour, based on 10 hours use per day, the yearly cost would be a little over $190.00. Comparing this with one of Orphek’s Atlantik pendants, the cost would be right around $91.00 per year, and amounts to a savings of $100.00 per year just in electrical consumption, and provide more useful PAR than a metal halide system. You can add to this the cost of yearly lamp replacement and energy use by supporting equipment such as fans and chillers typically required with metal halide or HQI systems. Yes, the initial investment for LED systems is a little higher, but in the long run you will be saving a substantial amount of money which soon pays for the LED system. There are many options available to aquarists with LED lighting, including full hoods, retrofits, modules, strips, pendants and plenty of sources for components for DIY’ers. The specific wavelengths Orphek LED’s produce definitely will make the colors “pop” in our fish and corals, they also produce the beautiful ripple/shimmer effects associated with higher output lighting such as metal halide and HQI. These are often labeled as stunner strips or LED PAR lamps which are becoming increasingly popular for retrofit purposes. A word of caution should be noted here. There are many LED fixtures available to aquarists that are not meant, or falsely advertised as primary aquarium lights. These LEDs will give aquarists not doing their homework, a false impression that LEDs are not powerful enough for a Reef or planted freshwater aquariums. Our advice is to do your homework on a LED system you may consider purchasing to ensure PAR value, lumen output, and Kelvin temperature meet the needs of your inhabitants. Another factor to consider is advertised lamp life, it could be misleading. Presently, many of the high power LEDs that are being produced by reputable LED manufacturers claim 50,000 hour lamp life. This is achieved by not exceeding the recommended operating current of 350mA per lamp. Some fixture manufacturers may overdrive LEDs in an effort to reduce the number of lamps in the fixture which in turn lowers production expense at the cost of lower lamp life. All of the above should be carefully researched before making your LED lighting purchase. Orphek LEDs are always driven well below their rated output to ensure long LED life. As you can see, the future of LED lighting is very bright (no pun intended). High power LED development is increasing on a daily basis along with component costs steadily dropping. It is hoped that this information will be beneficial to those considering switching to, or supplementing their existing lighting with LED technology.